Has a doctor ever scared you? Have you ever felt intimidated by a medical professional who was insisting you follow a course of treatment that’s mainly focused on prescription drugs? Has a diagnosis ever been delivered in a way that left you feeling frightened, shaken or disoriented? Unfortunately, it’s a tactic used by some well-meaning doctors to get their way, without giving you the option of taking control your health. In sharp contrast, the Save Institute is dedicated to providing the information and resources that the Medical Establishment doesn’t share. And we know full well that it’s also important to address the emotional impact of a diagnosis that confirms a ‘disease’, such as osteoporosis and osteopenia. Today we’ll look at 10 effective ways to recover the calm, the positivity, and the self-assuredness than can be stunted by the shock of an osteoporosis (or other) diagnosis. How you feel really matters. Emotions, as much as they seem intangible, are rooted in the physical, neurological, and hormonal systems of your body. And the way that you feel isn’t even the final result; the changes to those systems that create the experience of your emotions have a physical impact on your body as well. When you experience stress, regardless of its source, your adrenal glands start to produce cortisol. In a normal situation, in which something stressful arises and your body releases cortisol, the hormone helps your body to overcome the situation and then cortisol levels go back down. That’s a good thing. Plus, cortisol is acidifying, meaning it directly contributes to the acid/alkaline imbalance that leads to bone loss. 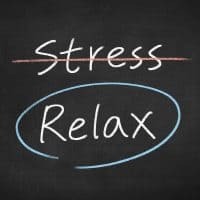 When you’re chronically stressed and you’ve crossed the line that divides cortisol being useful to your body and entered the stage in which cortisol is harmful, in addition to the detriments described above, the hormone weakens your immune system. You see, stress hormones interfere with the communication between the cells of your endocrine, nervous, and immune systems. This is a result of their impact on the thymus, the gland where lymphocytes are produced. You might know lymphocytes by their common name: white blood cells. On top of disrupting the production of white blood cells, stress hormones also inhibit the production of the substances that stimulate their activity: cytokine and interleukin. So while cortisol and other stress hormones are not the direct cause, they weaken your body’s defense system which can allow pathogens to take hold. Fortunately, you have the power to consciously prevent excess stress by engaging (or not engaging!) in certain actions. 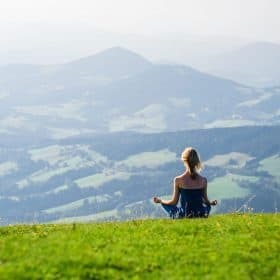 I’ve compiled ten powerful ways for reducing stress, improving mood, and shaking off the negative feelings that can get their start in the sterile and too often threatening environment of a doctor’s office. This is an important first step to combatting a state of mind that most tend to skip over. Just ignoring a feeling, pretending you don’t feel the way you do, is a classic form of “bottling up” your emotions. And like that metaphor suggests, it doesn’t help your feelings change or dissipate. It just pressurizes them for a later explosion. It’s normal to feel stressed, negative, depressed and frustrated every once in a while. That’s a part of being human, and we all know that life has its ups and downs. But it’s important to not obsess over your negative feelings. If you keep thinking about them, you’ll create a negative feedback loop that will consume your energy uselessly. So once you’ve acknowledged how you’re feeling and given yourself permission to feel the way you feel, take a moment to direct your attention somewhere else. One way to do this is taking a few minutes to sit still and focus on deep breathing. Just observe the way you breathe, and focus on the sensation of your breath entering and leaving your body. Make sure you’re breathing down into your abdominal cavity, and not up into your chest. You can read more about bone healthy breathing here. Another possibility is to dedicate a few minutes to observing what’s going on outside of yourself. Look out the window and just mentally make note of everything you see: the colors of the dresses of the people passing by, the direction the wind is blowing, the temperature of the air, and the warmth of the sun. Now you’ve given yourself the space to be where you are, without fixating on the problem. You’re ready to start trying some of the next actions. While you’ve acknowledged your feelings and escaped your own head, those feelings and the sources are still swirling around inside. Find a release for them. This can be as easy as talking to someone: a spouse, a friend, a therapist, a neighbor. And if you just need to put your feelings to words and be heard by an open ear, let your listener know that’s what you’re looking for. Some people prefer writing to speaking, especially if social interactions make them feel stressed. A journal, a scrap notepad, or a computer screen can serve the purpose equally well. Writing about your feelings can be a powerful ritual to identify exactly what is bothering you, and then being able to close the book, crumple the paper, or file it away. There will always be bumps along the way. Don’t let setbacks knock you off course, and don’t feel like you’re a failure because you didn’t accomplish a goal perfectly the first time. Every time something goes wrong, you learn from it. That learning is valuable, so don’t dismiss a mistake or a misstep as useless. Embrace what you now know, and use it to march forward! If you’re too scared of making a mistake, you’ll never take action at all, and the stress of worrying about potential mistakes is probably making the situation worse. Get specific about it. Specify what you’ve learned by a situation gone awry and put it in words to yourself, to someone else, or on paper. Then make a note of how you can avoid that pitfall next time. You’ll get back on track more prepared than you were last time, and without the stress of fearing you’ve gained nothing along the way. Sometimes, when certain life events are getting you down, it winds up feeling like a train wreck that you just can’t stop watching. The traffic of your life can snarl to a stop as you keep rubbernecking at the one thing that isn’t going well. So get back on the highway and stop gawking at a source of stress. Intentionally take a moment to examine some parts of your life that are going well. These can be tiny, large, tangible or intangible. It could be the houseplant that’s flourishing, the volunteer position where you’re deeply valued, your consistent exercising for your bones, or your great taste in shoes! Even the fact that you’re consciously taking a moment to use this strategy is one new habit that you’re accomplishing. Focusing on those parts of your life will distract you from the source of stress and get you moving forward again. Thinking is easy. And when we’re stressed we get caught in that nasty feedback loop of thinking about why we’re stressed, then feeling stressed about feeling stressed, and so on. Instead of dwelling on why you feel stressed (which may not be a factor under your control), think about how you can change the way you feel. Outline for yourself the small steps you’ll take to improve your mood and leave the stress behind. By doing this, you can escape the paralyzing feedback loop of self-analysis and get refocused on actionable steps that will lead you to a better place. You probably heard about writing gratitude lists, or making a daily habit of meditating. You can use a small version of this idea any time. When you’re feeling tempted to give in to feelings of sadness or stress, fight back by articulating some things you can be thankful for. These can be incredibly simple. In fact, sometimes appreciating things we too often take for granted is the most impactful redirection of energy. You might take a moment to inwardly (or outwardly!) express your gratitude that you have drinkable water, that you have food to eat, that you have a roof over your head and a bed to sleep in, that you live in a place not under continuous threat of war or famine or disease. Sometimes it feels like everything is at rock bottom. Different problems converge and make each other worse. Stress becomes overwhelming and it doesn’t feel like things will ever get better. Check in with what you already know: if you’re at the bottom, there’s nowhere to go but up. Sometimes things have to get rough before we can muster the will to tackle the challenge of changing them. Remember that circumstances can and will change, like they always do, and that your desire to make things better will steer that change in the right direction. Sometimes the key to escaping worry is to get active. Keeping busy and active is important, and sometimes the ‘doing’ itself is more important that what you’re doing. Create some habits that help you move forward every day. Set yourself a few simple goals and write them down. Once you’ve accomplished them, check them off your list. Subdivide larger tasks into smaller steps that you can complete one by one. This may help you to get started and avoid feeling paralyzed by how much you have to do. It’s easy to get lost in a nightmarish web of hypothetical situations. Vague fears, and what-ifs can overwhelm you and leave you stressed and inactive. Falling down the well of imagined disaster scenarios can create more problems than whatever triggered the fears to begin with. Ask yourself honestly: what is the worst realistic outcome? Once you’ve nailed down the actual worst possibility you’ll probably find it’s not as bad as the monsters your brain conjured when you let it run wild. Now you can assess how to avoid that outcome, and what you’ll do if it does happen. Having a worst-case plan can help you stave off the anxiety that makes it more likely to happen. Often the best way to calm the mind is to engage the body. Leave your worries behind by occupying yourself with an activity that has positive benefits: exercise. For example, you could go for a walk or a jog; maybe it’s throwing a frisbee with a friend or partner in the park; or maybe it’s joining a yoga or dance class. Exercise improves mood by releasing endorphins and directly reducing cortisol levels. Plus the benefits to your cardiovascular, muscular, and immune systems all work together to keep you feeling good. When you’re fighting the stress that deteriorates bone, exercise is a particularly impactful response, because of the benefits of exercise to bone health. When you engage in weight-bearing and other targeted exercises, the muscular force that is applied to your bones actually stimulates new bone growth. 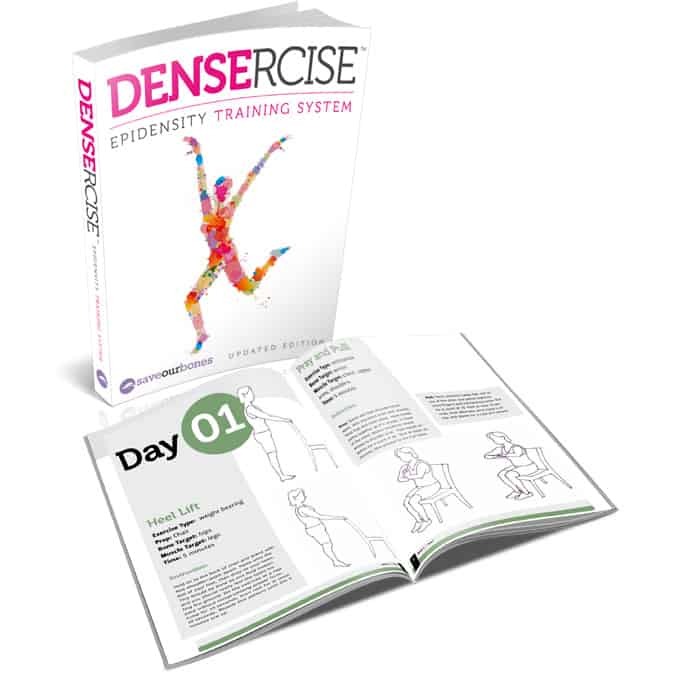 The Densercise™ Epidensity Training System was created to provide the maximum stimulation for bone growth. If concerns about osteoporosis or osteopenia are part of what causes stress in your life, then Densercise™ can help assuage your negative feelings in multiple ways. Not only does it offer the stress reducing benefits that all physical exercise offers, but it’s directly and efficiently addressing the source of your concern. I hope that these suggestions prove useful, and that you remember that you’re not alone on this journey! We’re all experiencing the ups and downs that are a normal part of life. And if you’re reading this, you’re already well on your way! I started with these exercises last year. six months after starting, I had my 2 year bone scan, it still shows osteoporosis, and the doctor begged me to take the Fosamax, which I couldn’t if I wanted because of the side effects (my esophagus is bad now.) apparently he didn’t pay attention to the numbers because I noticed a tiny note that said I had improved bone density by 1.7%. a tiny improvement, but I was only on the program for six months, so I am very encouraged by the exercises. next time I have an appointment I will point out the improvement. Can’t have a scan for another year and a half, but I am convinced it will be better. Thank you for sticking with all of us that are fighting Bone Loss. Stress is a real pit fall. I fight it all the time. Life is so complicated. You’re right, if we dwell on bad things long enough, they will affect our overall health. I plan to reread my Save Our Bones manual. Bless you for doing so much research. If you are on WARFARIN or ASPIRIN you CANNOT use the essential oils. Regarding my previous note on using essential oils to help with bone density, MAKE SURE that the oils you use are pure, organic, and unadulterated, otherwise you will get no clinical benefits and the whole exercise would be futile. So sure that the oils are of the best quality from a reputable source and not cheap over the counter stuff. if you are on WARFARIN or Aspirin you can use the, if on any other meds please consult a qualified Aromatherapist before using them. Also please do a patch test first to test for skin irritation. I am studying aromatherapy and have come across information that applying essential oils topically on bones may help in increasing bone density. Try using cypress, fir, and helichrysum essential oils mixed with a carrier oil such as grape seed oil. Mix 15 drops total of the three essential oils in 30ml carrier oil and have it massaged over your body or the area that has most bone damage and in need of bone repair. Apply oils topically 3x daily to area. You need to give it some time to take effect, but this is a natural solution and worth a try. These three oils are renowned for their healing properties. If anyone has good results please let us know and post here so that we can help others. Of Sight. It is very effective @ this moment of my life. of us. Have a wonderful day. I am disabled with Osteoporosis having lost 9inches in height, and am unable to leave the house on my own. In a wheelchair every bump hurts. I am unable to do the exercises. Is there any I can do sitting down? Also now have osteoarthritis starting in my knees. You may want to check out some ‘chair yoga’ videos on YouTube. You can start and stop them as you need to. I attach a link to one for people in wheelchairs, below in this comment. All the best to you and try to keep moving. Take care. Thank you v v much for this article and all the links that you put in it as well. It has come at a good time for me as I have been almost beside myself with stress for a month, pacing up and down at night etc etc. I knew it was bad for me but I just couldn’t stop the loop. I am 70 with osteoporosis. I have tried looking at various websites talking about bad mistakes and stress and they haven’t helped as they seem directed at younger people with time to rectify. However, your article and all the links have made a difference already. The link to foods to relieve stress and the wonderful video in that link particularly. I watched and listened to it a straight 6 times, all the while sniffing lavender oil from the bottle. I live in England UK. and the song is ‘Fall comes to New England’. Thanks to you and your article and all the links to more information I think that I have turned the corner and that I will sleep tonight. Thank you so much. Thank you so much for adding these clear, highly effective, accessible tools! Once again, you’ve made all the difference. Plus, you’ve made it Christmas in May! Thank you Vivian for this email. I think you may have just answered the question of why I have osteoporosis. Since having C.F.S. in my mid thirties I have had high levels of cortisol in my blood and a low white blood count. I feel stressed and also suffer panic attacks. I also have very low sodium levels. I am now in my mid sixties and have acquired other health problems along the way. I try to follow your advice as much as possible. I was told when I was 57 that I had the bones of a 90 year old and because I refused to take medication I will not be seen at the clinic again. I hope they feel proud of their scare mongering. very helpful in educating me about osteo., once I got my head thinking in the right direction I was able to cope with my diagnose. I have been following your program for several years and are so thankful for keeping me educated on this subject. Thank you, Vivian, for this toughtful article. Very refreshing and I could say even motherly. I see that the information you give is getting more and more caring and useful. You truly love what you do! And also the people you reach out to comfort and help! I have a definite diagnosis of osteoporisis that deteriorated 50% in 5 years. I have constantly resisted drugs as I react badly to most. My consultant basically told me that if I feel and fractured my vertebrae that I would die. When I was tearful he then told me I was depressed…. so now all I do is cancel the appointments as I can’t deal with his aggression…. Yesterday my bone density was so bad I started to cry. I have lost 3 lbs since my last scan. I have fought with them about going on forteo. Now do I really have a choice. Anyone know much about it? Everything I read is negative as I fade away I am frightened. I am so thin and have severe scoliosis. Thanks anyone who can help! Terry, you may not realize it, but you have already taken the most important step in recovering your bone health: you’re reaching out! You’re clearly seeking information and researching your options, and you’ve tapped into a supportive and knowledgeable community. Please take some time to search this site and connect with other Savers, and you’ll feel much, much better as you begin to realize you have positive, drug-free options. Hang in there! I read all of the emails you send, and I practice most of the healthy helpful and healthful tips you offer…BUT, today’s list, with the extremely meaningful and clear explanations is the BEST yet! I am fortunate to have made these 10 steps a part of my life for most of my life, and I can attest to the value not only of Positive thinking, but Positive Living. 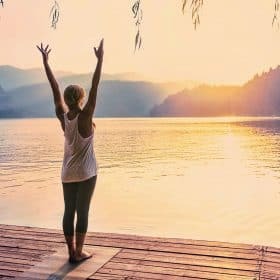 Exercise, Yoga, Meditation, refocussing, sharing and expressing gratitude all create and reinforce the foundation of a healthy and happy life. We are part of the Universe, built from the same material…it’s SO good to recognize and honor that. Thank you!!! Wow, Sheri! I am so glad this information really resonated with you! 11. Find something to make you laugh. Thank you for the reminder, Linda! Laughter is excellent medicine. Good advice. What do you think of aromatherapy for osteoporosis? Thank you, Vivian, for this morning’s “pep” talk…. love it!